When Gensler began designing Terminal 2 at San Francisco's international airport, they weren't necessarily aiming for LEED Gold certification. Rather, they were trying to think about travel in a new way by figuring out how they could reduce an individual's environmental impact, even as they take part in a carbon-intensive activity like flying. Their goal for the new terminal was not to just improve upon standard airport design, but to re-envision it in a way where people would actually look forward to spending time waiting for their flights. With innovative mechanical systems, natural daylighting, clear signage and a variety of behind the scenes sustainability strategies, SFO T2 has become a destination unto itself. And the LEED Gold certification? Well, that's just an added bonus. Click ahead for our exclusive photos of the vibrant new travel hot spot, and read on for some insight straight from Gensler's design team. Costing roughly $383 million, the newly renovated 640,000 square foot terminal is home to Virgin America and American Airlines, and has already met 3.2 million passengers this year alone. Completed in April 2011, T2 includes a slew of sustainability strategies aimed at reducing the carbon footprint of travel. On the operations side this includes energy and water efficiency, reuse and recycling of the old terminal building’s materials and aggressive recycling and composting policies. To help green the traveling experience for fliers, the airport provides hydration stations for passengers to fill up their re-usable water bottles, signage to educate travelers on sustainable issues, local and organic food vendors and an intuitive, naturally daylit space. The terminal is directly connected to BART (San Francisco’s mass transit system) so passengers and employees can access it easily. Gensler aimed to elevate the traveler experience by placing a strong emphasis on service, hospitality and comfort. To ease the stress of the security area, the terminal features a recompose area so passengers can gather their belongings and get situated in a more leisurely fashion. A variety of shops, restaurants, lounges, children’s play areas and seating options give the terminal a more club-like feel by catering to everyone’s desires, all while making it easy for them to still keep tabs on what is going on at their gate. 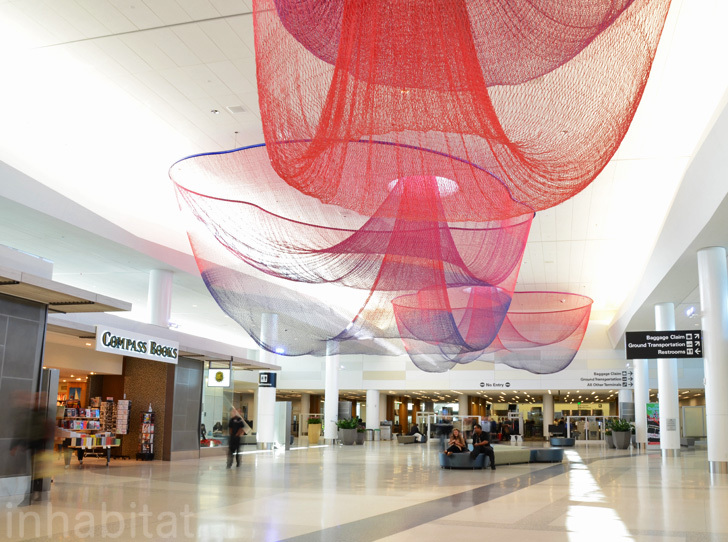 Sculptures, paintings and installations enliven the terminal and provide fun distractions. 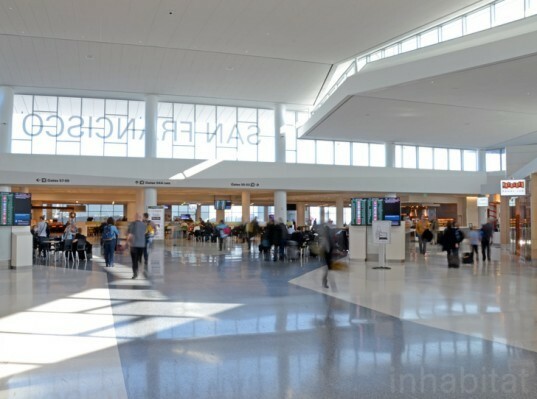 Inhabitat also had the chance to speak with Melissa Mizell, Design Director at Gensler, about the design of Terminal 2. Keep reading for our interview with Melissa. Inhabitat: Being the first LEED Gold airport in the US, how is the design for the new Terminal 2 above and beyond other airports? Melissa Mizell: The key to our design at SFO was to look beyond LEED. We wanted to achieve a high level of certification, and we were looking to inspire people to live more sustainably. The building itself is green, but more importantly, it’s catalyzing people to change their behaviors. You see that most clearly in places like the Hydration Stations, or the composting program. Sustainability becomes very human and very personal at T2. Inhabitat: What were some of the challenges of designing and building around a busy international airport? Melissa Mizell: The air traffic control tower for the entire airfield sits atop Terminal 2, so we were acutely aware of maintaining access to it and protecting its structure. The tower is located immediately above the TSA screening area, so we couldn’t raise ceilings there. We looked for ways to take advantage of that kind of constraint, and make lemonade out of lemons. Inhabitat: How does your design help passengers reduce their impact? Melissa Mizell: T2 engages passengers in its sustainable programs and personalizes them. The idea is that we all contribute to sustainability in our own way. For example, when you read the signage at T2, the tone of voice is personal. It puts the sustainable programs in perspective, as if the passenger themselves made the changes. It’s about empowering people to take on the challenge of living more sustainably, in their own way. It’s not overly preachy, it’s conversational. Inhabitat: On the airside, what technologies help reduce the footprint of the planes and their associated equipment? Melissa Mizell: I’ll defer to SFO to offer specifics on their emissions reduction plan. But, the basic idea here is to leverage T2’s preconditioned air and efficient power systems to supply planes with energy and air conditioning while they are parked at the gates. The building’s MEP systems are more energy efficient than the planes’. Inhabitat: What is your firm most proud of with this completed project? Melissa Mizell: That’s easy to answer! We’re most proud of the fact that people are telling us that they actually want to spend time at the airport, because they think it’s a great place to be. They show up early for their flights, or they’re hanging out after they land. That’s the ultimate accomplishment: making the airport a place that people really want to be. 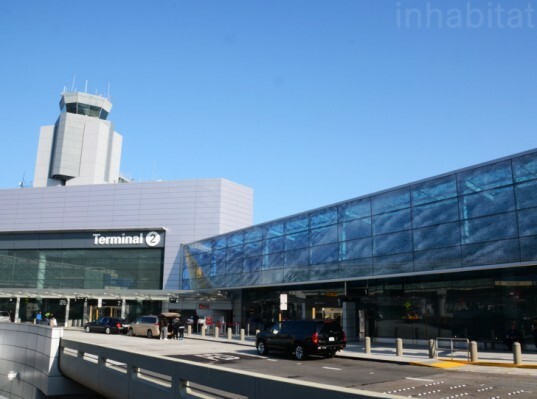 Costing roughly $383 million, the newly renovated 640,000 square foot terminal is home to Virgin America and American Airlines, and has already met 3.2 million passengers this year alone. Completed in April 2011, T2 includes a slew of sustainability strategies aimed at reducing the carbon footprint of travel. A variety of shops, restaurants, lounges, children's play areas and seating options give the terminal a more club-like feel by catering to everyone's desires, all while making it easy for them to still keep tabs on what is going on at their gate. On the operations side this includes energy and water efficiency; reuse and recycling of the old terminal building's materials; and aggressive recycling and composting policies. To help green the traveling experience for travelers, the airport provides hydration stations for passengers to fill up their re-usable water bottles; signage to educate travelers on sustainable issues; local and organic food vendors; and an intuitive, naturally daylit space. The terminal is directly connected to BART (San Francisco's mass transit system) so passengers and employees can more easily access the airport. Gensler also aimed to elevate the traveler experience by placing a strong emphasis on service, hospitality and comfort. To ease the stress of the security area, the terminal features a recompose area so passengers can gather their belongings and get situated in a more leisurely fashion. Sculptures, paintings and installations enliven the terminal and provide fun distractions. Inhabitat also had the chance to speak with Melissa Mizell, Design Director at Gensler, about the design of Terminal 2. Main atrium and corridor of the newly renovated terminal. The corridors and atriums are bright, open and airy spaces. A dramatic ceiling sculpture in the recompose area by Janet Echelman. Passengers can gather their belongings in this stress-free zone. Local and organic food options abound. Interactive artwork in the children's play areas by San Francisco artists Walter Kitundu and Charles Sowers. A variety of seating options in the boarding areas. More views of the food vendors. Decked out for the holidays. Inhabitat:What is your firm most proud of with this completed project? The concourse area features restaurants by celebrity chefs Tyler Florence and Cat Cora.